Does the Side Socket Really Work? The Side Socket is a way to get your cords out of the way behind your furniture, by moving them off to the side instead of having them sticking straight out. Seems like a rather smart idea, but since it’s sold on TV it immediately build skepticism. So let’s see if it actually works. If you’ve got a tangled mess of cords behind your entertainment system, or you have to keep your furniture pulled out and extra few inches to accommodate an outlet, this might be the product for you. It prevents you from having to have a big grouping of cords, and it’s supposed to make it so you don’t shove your furniture up against it, potentially bending the cords too much and creating a bigger problem. The makers of the Side Socket claim that their rotating socket solves all of these problems, and allows you to plus up to 6 devices into one socket, but have them moved to the side so that it can lay flush with the wall. This reduces the space it sticks out from around 3 inches or more to just about one inch. This allows you to move your entertainment center, couch, table, or chair right up against the wall. The accompanying infomercial is the hype machine for this product. It’s a pretty innovative idea so it doesn’t need a lot of help to make sales, but they do a good job of showing you the different ways that it could come in handy, and you can tell that they did a brainstorming session to see where else in the home it could be used. For $26 you’ll get two Side Sockets shipped to your door. This is because it’s sold on a Buy One Get One* *just pay shipping sort of set up. The real danger of this kind of pricing structure is that you’re paying more for shipping than you are for the actual products, so if you end up returning them you’ll be out the return shipping costs, plus the $16 you originally paid to receive them. This means that no matter what the outcome, the company is going to pocket the $16 less whatever it actually costs to ship them. Once you have all of your devices plugged into it, and the furniture moved back, this is a set and forget type of product that you won’t have to think about anymore. Once you have your furniture in place, you’ll have an easier time accessing the plugs if you want to add more to it in the future. This is because you won’t have to take such a funny angle to get them into the socket, they’ll be more accessible from the side, and will need less clearance so you can just reach back and plug them in. The Side Socket is one of those products that when you see it it just makes sense, and makes you wonder why they haven’t made something like this sooner. By redirecting the plugs off to the side it solves plenty of problems, and by turning two sockets into six it’s serving the purpose of a 6 plug outlet. 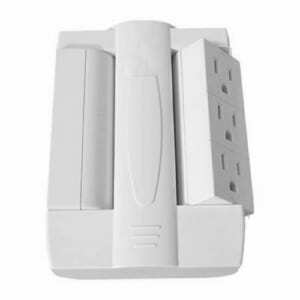 Since it’s on the wall, it keeps your floor clear of unsightly cords, and since it splits up the 6 outlets with 3 on one side and 3 on the other, there’s less chance of having them get tangled. One potential drawback to this is that if you have several AC adapters that take up a lot of space, or are heavy, you may be better with a strip than this wall mounted version. Also, some buyers have mentioned that they wished it came in black, since the only current option is white, and for some homes this might stick out like a sore thumb. The Side Socket is getting our Risky Try rating, based on its pricing structure, and lack of unbiased third party reviews. We’re always hesitant to recommend a product where the company stands to lose nothing if their product doesn’t work. In this case they have it set up so that it’s win-win whether you keep it or not. If they were truly sure of their product, and wanted to have a genuine guarantee they would set the product at $10 each and only charge $6 shipping so that if it didn’t work you’d get the $20 back and only be out the reasonable shipping charge. As long as you’re aware of the possibility that it might not work out for you, and that you’ll be out around $20 if you don’t like it and want to return it, this might be worth trying out. However, you might want to take a pass on it if you’re not keen to be a virtual guinea pig to see if they work. It might be better to wait a bit and see if they end up in stores like Wal-Mart or Bed Bath and Beyond before swallowing the high shipping costs. What do you think? Does the Side Socket work or not? Do Zygor Guides Really Work at Leveling Up?